The bumper stop and poles at the end of the tracks of Phase One before work began. Work crews removing the train bumper from Phase One at the end of the westbound tracks at Culver City Station. Another view of pole removal work. Removing poles from Phase 1 to make way for the tie-in work. It has been a big week for Metro Rail projects: the Purple Line Extension broke ground Friday, excavation work on Crenshaw Boulevard got underway this weekend for the Expo/Crenshaw underground station and now this: work began to tie the electrical and communication systems together where the two phases of the Expo Line meet just west of Culver City Station. 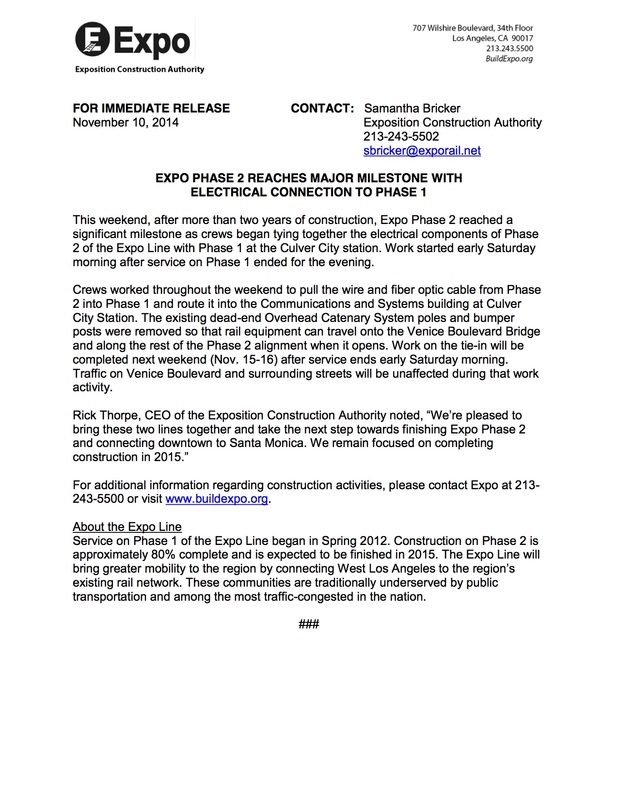 Please see the above photos and news release below from the Expo Line Construction Authority, the independent agency building the Measure R-funded project (here’s the project website). The second phase of the Expo Line will extend the tracks six miles from Culver City Station to downtown Santa Monica with seven new stations. The line is forecast by Metro to open in the first half of 2016. At night time, on the Venice Blvd. bridge, I observed that there are a chain of illuminated lamp posts along the rails from end-to-end. Will these be permanent? That is there to light up the emergency walkways between the tracks and will be there permanently. Wow I was there last Friday wondering when that bumper would disappear… Super awesome news! Next stop Santa Monica! Extend the green line north! The Crenshaw/LAX Line will allow trains to run from Redondo Beach Station to Expo/Crenshaw Station. Measure R also supplies money to start expanding the Green Line south toward Torrance. Up until now the The Expo trains had to slow down and sometimes stop wikkid early because the bumper makes the Auto Train Control hyper sensitive. With the bumper gone will the approach to Culver City station become smoother? or will it have to wait until Phase 2 officially opens? Awesome news Going to head to santa monica.